the MomTog diaries: We luv chikin!! ...and we LOVE free food!! 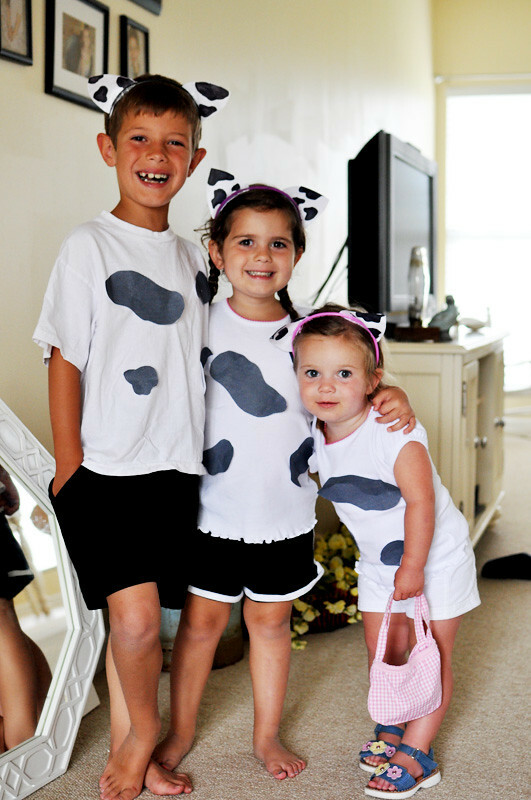 So tonight we got our "moo" on and the entire family, Todd and I included, headed to Chick-fil-a dressed like cows! We drove down the rode wearing our "costumes" including our big floppy cow ears that looked more like those of a dog. I'm sure people thought we were quite strange...until we stepped into Chik-fil-a where we fit right in with all the other desperate, free-food seeking "weirdos" in our town! It was quite fun...and did I mention how yummy their new Spicy Chicken sandwich is?! The best part?...everything we ordered was entirely FREE!! Can't beat that! Thanks Chick-fil-a!! Here's a snapshot of the kiddos in costume...I'm afraid we didn't get one of Todd and I...oh darn! Oh my gosh, how funny! We love Chick-fil-A too, but they never do this here! I'll be the kids will remember this for a long time. really alice? I thought it was for ALL chick-fil-a's. Weird. That's really fun. You have adorable kids!